Facebook: Making life better, one status update at a time. Has anyone else seen the beer commercial (I think it’s for Budweiser) with the guy who’s sitting at the bar being a wet blanket, mentioning all of these things that seemingly make life worse, like the economy, gas prices, global warming, and Mondays? Then, all of the other happy people at the bar start chiming in with things that make life worth living, like Fridays, chocolate chip cookie dough, and…Facebook. It is at this point in the commercial when I make my trademark sourpuss face. Facebook? Really? Facebook is what makes you feel good about life? 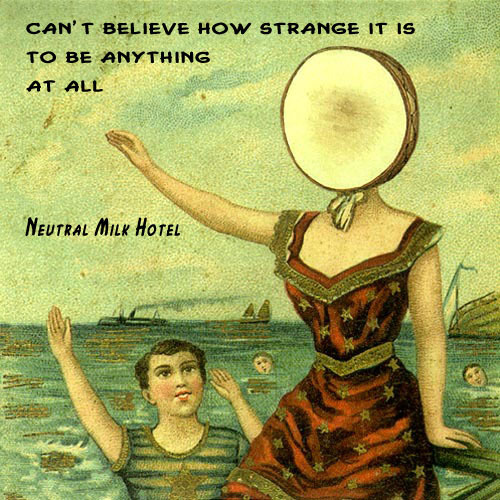 I found this concept deeply disturbing and felt myself becoming offended on behalf of the universe and life itself. Not to get too far off course here, but I recently listened to this story on Radiolab about how, basically, all life exists because of one imperfection that occurred when the universe was created. In the universe, there is matter and anti-matter. Because of their electrical charges, these particles attract each other and eventually collide and obliterate one another. The only reason anything exists is because, for every billion parts of anti-matter, there are a billion and ONE parts of matter. If that imbalance had never occurred, there would be nothing. So, when you look at this magical thing called existence, and you imply that Facebook is one of the better things about it…it just makes me mad. I know what you’re probably thinking: “Relax, idiot, it’s just a commercial.” But don’t you think it says something about our culture, that maybe our priorities aren’t quite where they should be? Yes, of course I’m on Facebook like everyone else and use it quite frequently, but I don’t think that makes me a hypocrite. I think Facebook serves three main functions. One: personal networking/staying in touch. Two: professional networking/publicity. Three: time-waster. 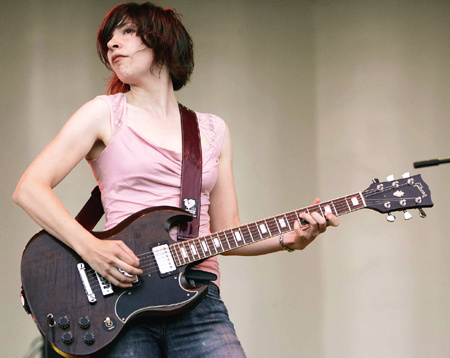 Beyond that, it is simply a web site that allows you to project a tailored, public image of yourself. Out of all the things that make me happy in life, I wouldn’t put it very high on the list. Would you? Hey, it’s an angry rant! Haven’t seen one of these in a while! To be mailed (that’s right, mailed) tomorrow. I am writing to explain a problem I have been having with your company for the past two years. Several times a month—and often it’s much more frequent than that—my husband and I receive phone calls to our home phone from people asking for Douglas Mills. We do not know who Douglas Mills is. On numerous occasions, we have told your operators to remove our number from your database and to stop calling our house. Every time, we are assured that this has been done, yet we still continue to receive phone calls constantly. Last night, there was a missed call from your company on our phone, so I called the number. Instead of a human picking up, I was greeted with a recording that immediately told me I was on hold. When I was eventually connected to a person, I explained again that Douglas Mills does not live in my house. I asked the female operator for the name of your company out of genuine curiosity, because at this point I am truly trying to get to the bottom of the issue. She told me that it was “OCS” but would not elaborate further. When I told her to stop calling, she hung up on me mid-sentence. I then called back and spoke to a different operator, Shawn Marcel. When I spoke to him, I asked him the name of the company. He skirted my question numerous times, eventually telling me that the company’s name was Omni, but when I asked what the “CS” stood for, he would not answer. He then told me that I “[had] no business” talking to him or asking him these questions. I said that I absolutely had business with the company since I am constantly receiving phone calls from them. When I told him I was planning to call back if he did not give me the basic information that I felt I was entitled to, he said I could “feel free to waste [my] time” and then hung up on me. Mr. Marcel’s customer service skills were absolutely horrendous and I do not think he belongs in a position where he is expected to interact with other humans on a daily basis. I called back a third time (this was January 16 at around 7:30pm) and spoke to a woman who was extremely helpful compared to Mr. Marcel. She verified the name of your company and even provided me with a mailing address when I told her I wanted to submit a formal complaint. She also assured me that the phone number was removed from the database, and even though I think there’s a good chance she was lying, I at least appreciate how she treated me with a degree of respect, however disingenuous. Unfortunately, I subsequently looked up OCS online and found the contact information for your Tampa Office. It does not match the PO Box address (P.O. Box 23381, Tampa, FL) that the wonderful operator gave me, so I am now worried that she may have been trying to lead me astray. Perhaps you can explain this discrepancy as I would hate to find out that she is a liar. In closing, I do not understand why, after explaining the very first time that Douglas Mills does not live at my address and no longer uses that phone number, that I should ever receive another phone call regarding that matter. At this point I truly feel badgered and, as much as you may want me to, there will never be a day when I am magically going to admit that, yes, I really am Douglas Mills. Please do not call my number ever again, and I would also appreciate a written acknowledgement to this letter. Thirty-six breads down, and only six breads to go! Unfortunately, this bread totally stunk. I knew it was going to stink based on all of the blog posts I read about it, and considered putting it off until later. But, that would only mean that one of the lasts breads I make would totally stink, and I don’t want to end the challenge on a bad note. So, I pressed on. It’s actually a shame that all of the bloggers hated on it, because that led me to cut a lot of corners, which didn’t help my bread at all. 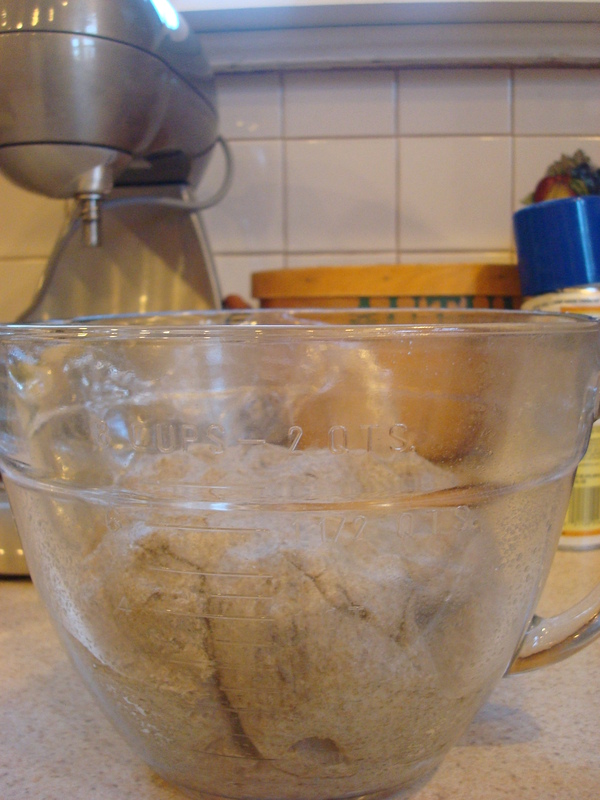 I started on Friday night by making the rye starter (barm + rye flour + water) and rye soaker (rye flour + water). Error #1: This formula calls for white rye flour and pumpernickel flour. I didn’t have either of these, and instead on embarking on a long and expensive flour search, I just used my dark rye flour across the board, which definitely cut down on the flavor complexity. 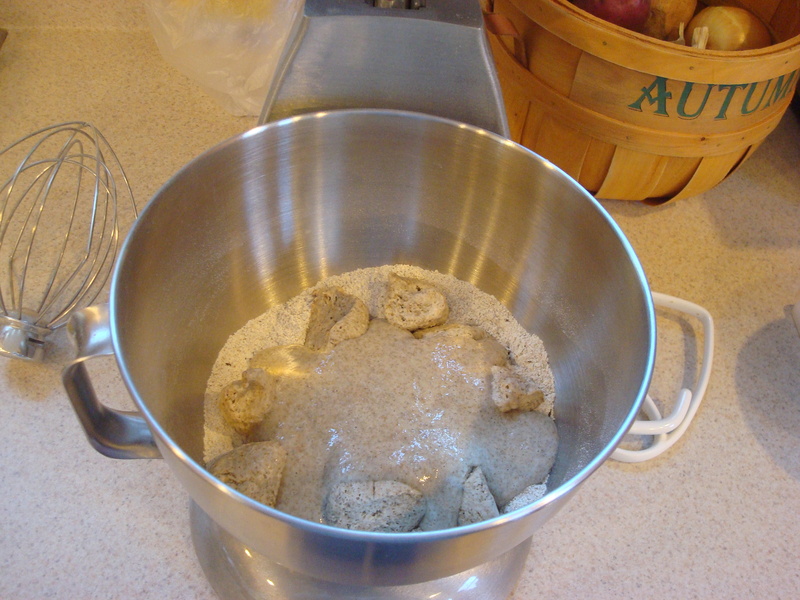 On Saturday morning, I combined rye flour, salt, caraway seeds, and the starter and soaker. 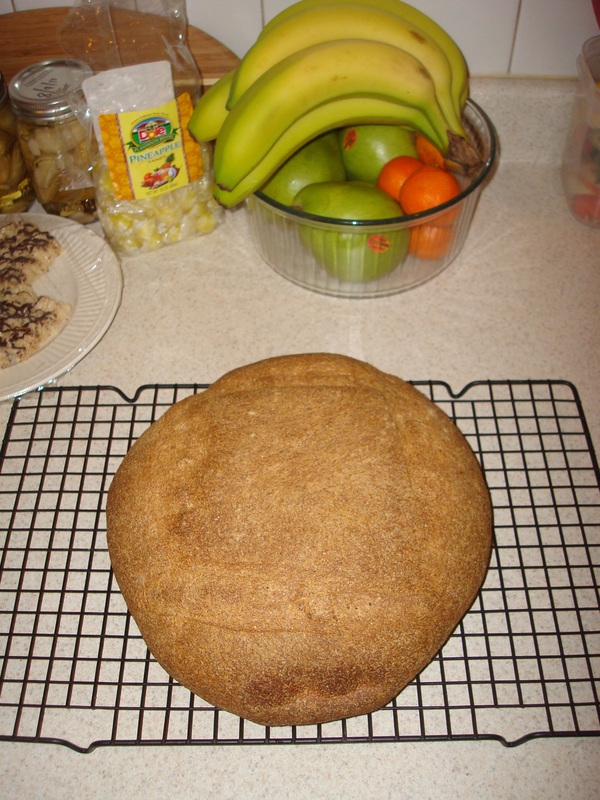 Rye flour/dough is brownish and not very pleasant to look at. 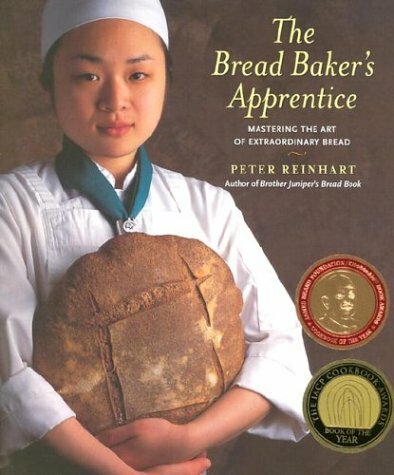 The formula didn’t even call for a small amount of instant yeast (which is often used in sourdough breads, just to kick-start the fermentation process). And, since rye flour has lower gluten content than regular flour, it takes a really long time to rise (and didn’t rise much at all). 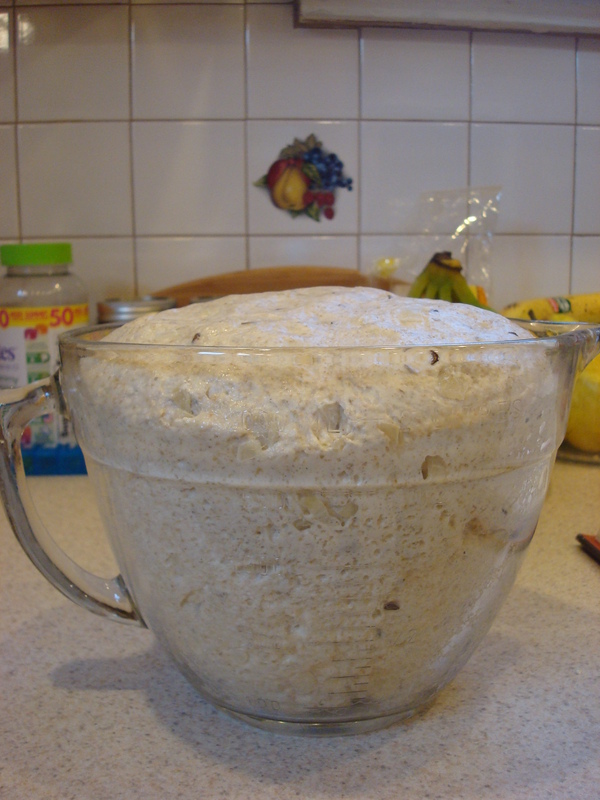 This is the dough before and after a four-hour rise. Hardly any change. If I had left it out for another couple of hours, there’s a chance it would have risen more, but I didn’t want to wait any longer—especially since it had to proof for another two hours after that. 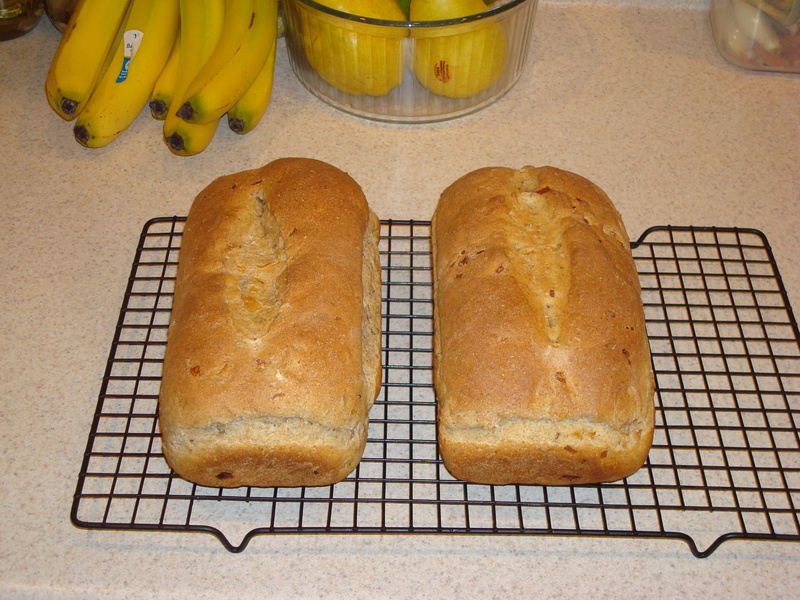 After forming the dough into two torpedos, I left them out for another two hours, again seeing a minimal rise. I baked them according to the directions. Once done, they didn’t look too awful. The funny part is, for such small loaves, they weigh about 6 pounds apiece. 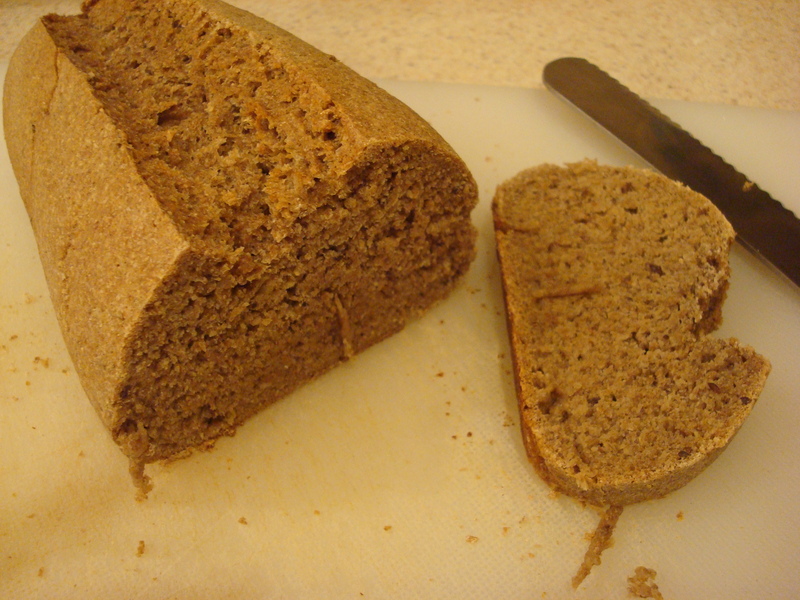 After cutting into it and trying a piece, it actually had a pretty decent rye flavor, despite being very dense. Unfortunately, they were totally underbaked! Like I said, I baked them according to the directions, the bottoms were golden brown when I took them out, and the loaves sounded hollow when I tapped on them. Despite all of this, they are very gummy. However, that didn’t stop me from eating about a third of one loaf that evening. What can I say? I was a little hungry. I tried toasting a couple of pieces to see if it would dry out the center, but that didn’t really do anything. I ate the last couple of pieces with some butter and strawberry preserves, and that was quite tasty. But, in that case, I think the bread was more of a delivery device for the preserves than anything else. 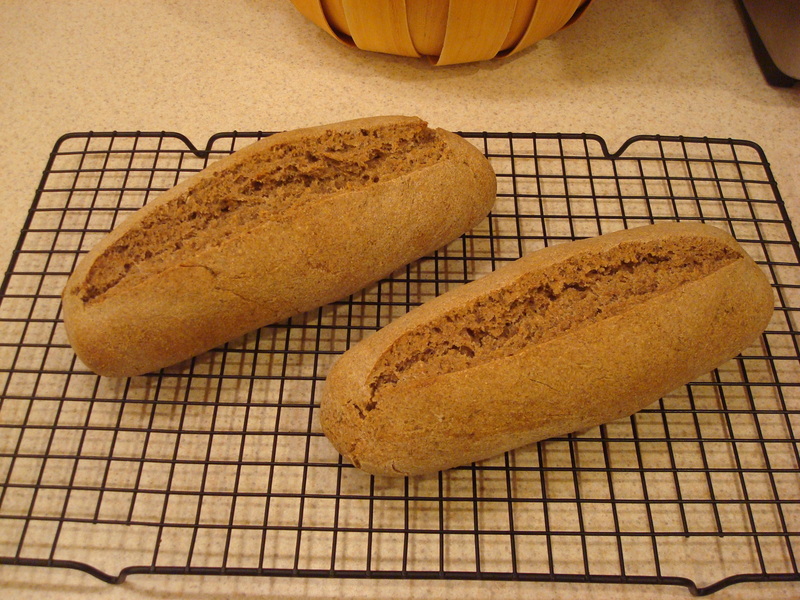 Next up: Poilane-Style Miche. I don’t understand two out of those three words, so I’m sure I’ll learn a lot from that bread. I’d better run out and buy a few pounds of pastrami, because this rye bread is off the charts. I have to admit: these homemade sourdough breads are changing my life for the better. Here’s what went down. 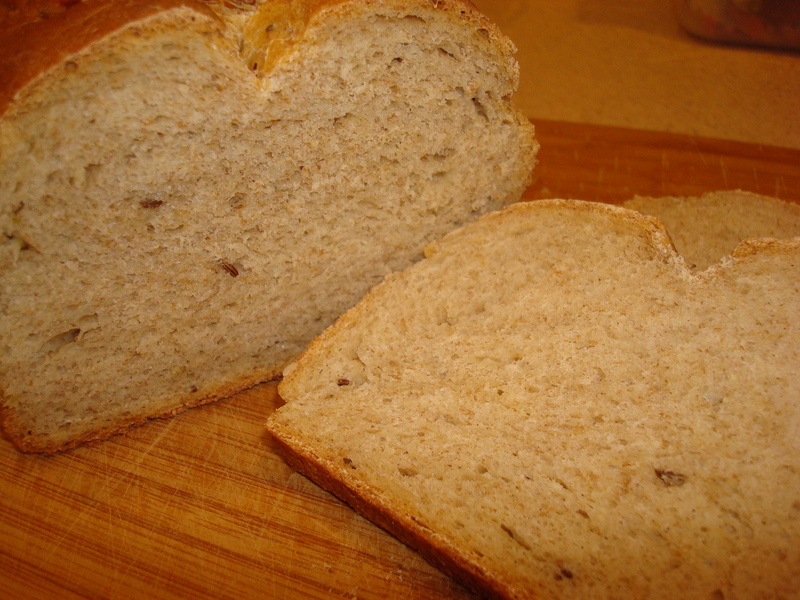 On New Year’s Day, I made the starter using 1 cup of barm, rye flour, water, and a wildcard ingredient: sautéed onions. Once that was mixed, it sat out for 4 hours until it doubled in size, then went in the fridge overnight. 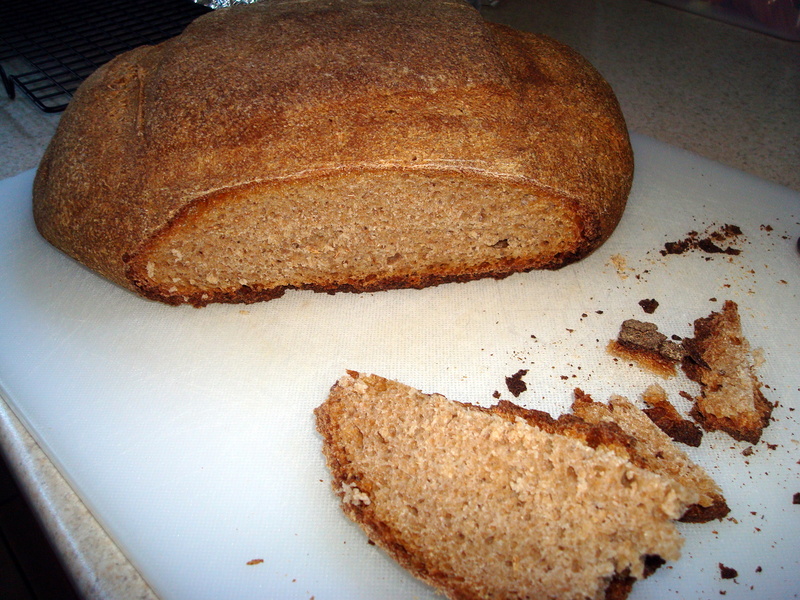 The next day, I made the rest of the dough, which called for bread flour, white rye flour (I wasn’t able to find that, so I used dark rye instead), instant yeast, vegetable oil, milk, and caraway seeds. 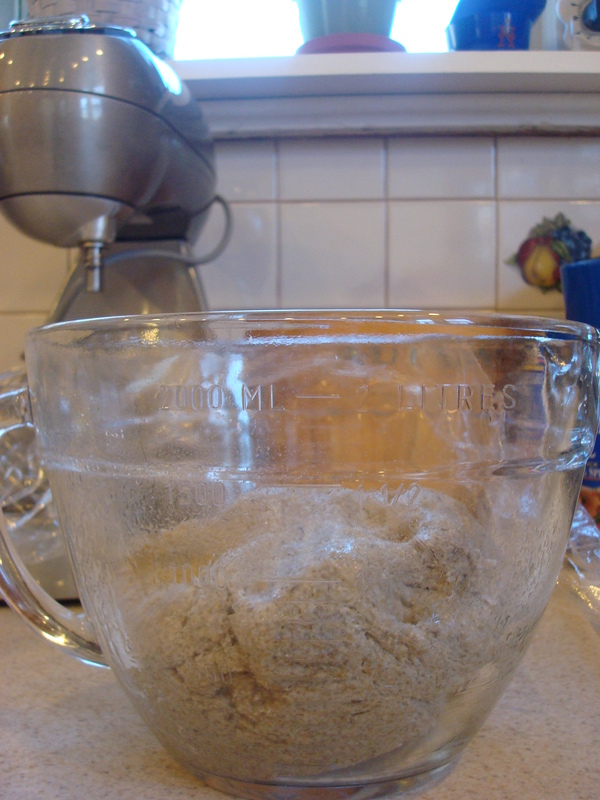 This recipe makes a lot of dough, and it was a little too much for my stand mixer to handle, so I wound up doing most of the mixing and kneading by hand, which was fine. I don’t want to get too spoiled by machines. 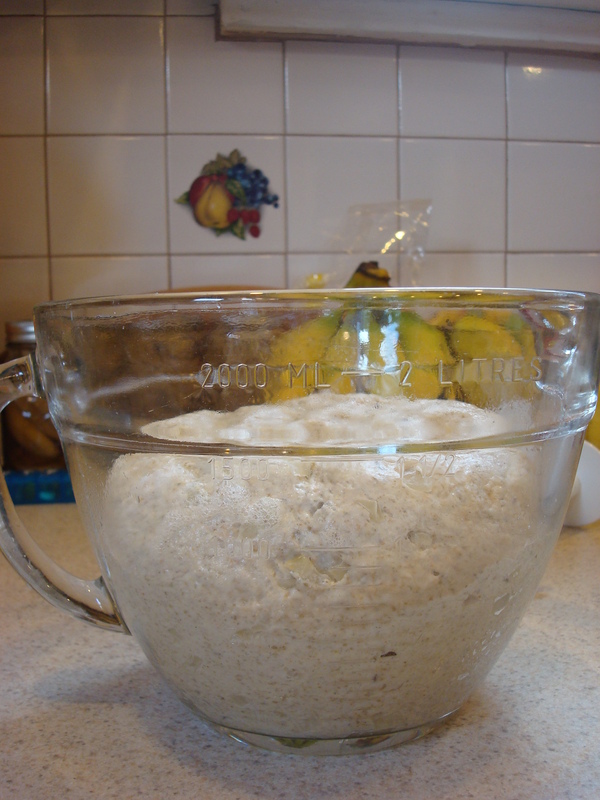 After kneading, the dough sat for about two hours. 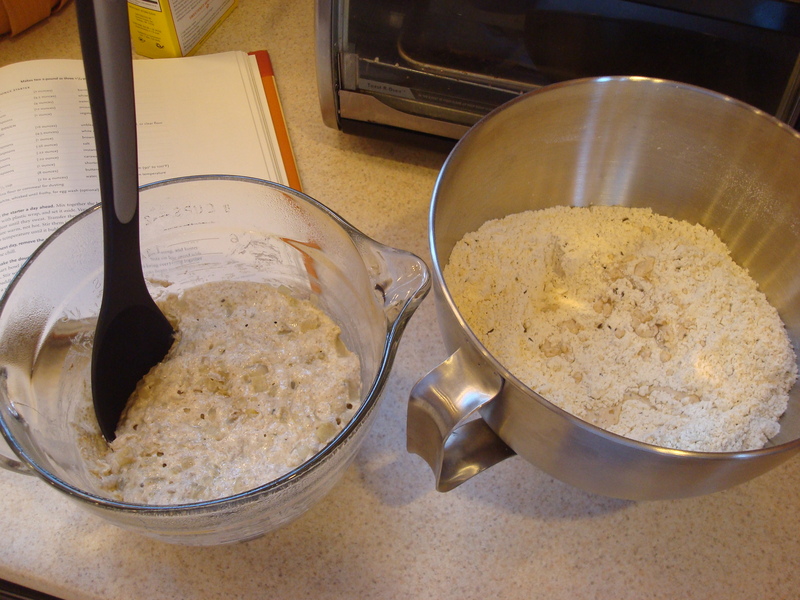 Below are the starter and dry ingredients, and the dough pre and post-rise. After the rise, I divided the dough into two pieces and let them proof in loaf pans for another hour and a half. They came out quite nicely! The crust is nice and firm, while the inside is…well, the only word I can think to describe it is “fluffy.” Very light and delicious. I can tell that the onions really made a world of difference. 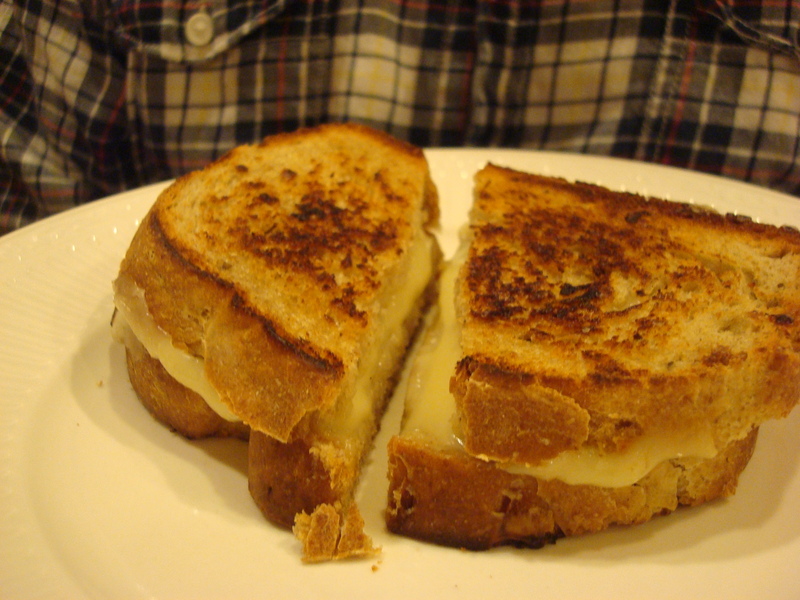 Not long after it came out of the oven, Michael made himself a grilled cheese sandwich, which was very tasty. But, we definitely need to invest in some deli meats in the near future. Next up: 100% Sourdough Rye Bread.